Well, I've had a great couple of weeks - I had a wonderful Thanksgiving with family and then Dan and I jetted off to San Diego for a wonderful vacation! 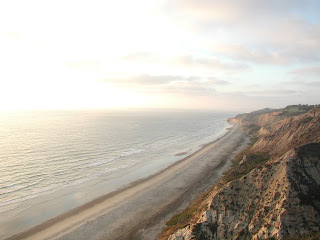 The picture above is from Torrey Pines, a gorgeous state reserve park where we hiked around one day (though I cannot take credit for that lovely photo). I've missed you all, but I did need some time away for a bit, but now I should be back in action! Look out for a banana bread and peppermint bark recipe to help you with all your holiday baking! Looks beautiful! So glad you had a relaxing time!